The status and the perception of small layouts as well as of dedicated shunting layouts has changed significantly within the railway modelling community over the past two decades. Once a modelling niche they have become a layout type bordering on mainstream. Here's a brief overview of how and why this happened, the advantages of small layouts, and how they relate to shunting layouts. How small is "small" ? Describing any object as small is, of course, not a very accurate label as it requires a point of reference: small in comparison or relation to what? In addition, we all know that certain objects can change their dimensional qualities. When compared to its G scale counterpart, an HO scale locomotive will appear to be quite small, but that very same item will lose that quality when we view it alongside a Z scale model. The notion of size in model railways changed as smaller scales were introduced over time: HO (1:87) in the early 1920s, TT (1:120/1:130) in 1945, N (1:148/1:160) in 1962, and Z (1:220) in 1972. A similar change - although only partly linked to the introduction of smaller modelling scales - has occured in the perception of just how small a "small layout" can be for it to be worthwhile to build and run trains on. From a historical point of view, the implicit message of the increasingly popular (and therefore influential) model railways hobby press was to "think big" and to be inspired by modelling giants such as John Allen (whose Gorre & Daphetid layout filled an entire basement from floor to ceiling in his California home) or the Pendon Museum layout (which fills the entire sprawling ground floor of a building in Oxfordshire). In his 1978 Creative Model Railroad Design, John Armstrong concluded that, based on a Model Railroader survey, model railroaders were indeed "denizens of the basement" as that was precisely where 51% had their layouts. 20% were located in a spare room, 7% in a garage, 4% in the attic, and another 4% had a purpose-built added room. In other words: at least 86% of the participating modellers in the late 1970s indicated having a spacious setting at their disposal - and thus felt no constraint to not go for a "basement empire". This was not, however, the case with British and European modellers, who have seemingly always been plagued more by a lack of space than their American colleagues - and the more restricted options available to them ultimately created the archetypal British "branchline terminus to fiddleyard" layout. The fiddle yard started to appear in the late 1930's when British modellers wanted to operate small layouts in a realistic manner; in the 1950's, Cyril J. Freezer would regularly feature fiddle yard to terminus type layouts as editor of Railway Modeller and as such had an enormous influence in spreading the concept and making it popular - adding his own design, "Minories", to the classic track plans of that layout type. 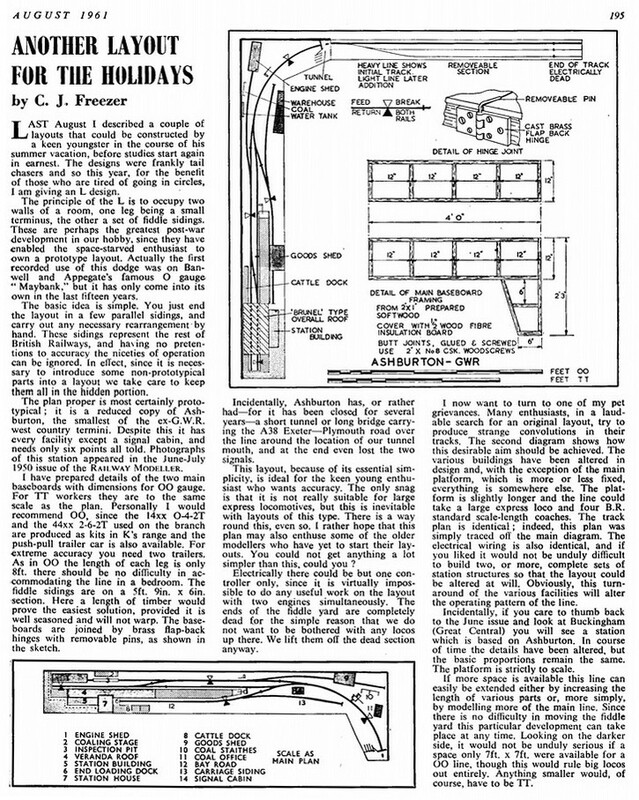 The example shown here is from the August 1961 issue, in which Freezer pointed to another feature often associated with terminus to fiddleyard layouts: the L shape. It became nothing less than a blueprint for legions of British layouts and is still widely featured today simply because it is a proven concept. Also used in European modelling, though often for the purpose of switching trains "behind the scenes" on a continuous run layout, it is known to German modellers as Schattenbahnhof, literally meaning "a shadow station", i.e. not intended to be visible to any onlookers. Freezer was a good friend of Linn H. Westcott, whose track plan designs were as influential in the US as Freezer's were in the UK. However, this didn't stop the concept of what would be called a "small" layout going off in completely separate directions in the UK and the States. While UK modellers were busily building what would come to be called "shelf layouts" with fiddle yards, a small layout to their American cousins was more like a solid plank measuring 4'x8' (120 x 240 cm). 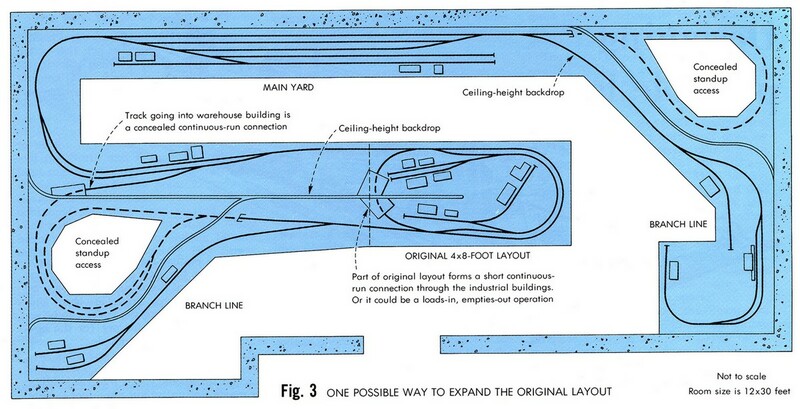 When Model Railroader published a collection of track plans in 1981 from past issues of the 1960's and 1970's, prolific track plan designer Ed Vondrak presented "a small track plan designed for growth": a solid 4'x8' (or preferably even 5'x9') continuous run which could be incorporated into a larger pike later on - and the accompanying design once again pointed model railroad planers to the basement or a spare room. 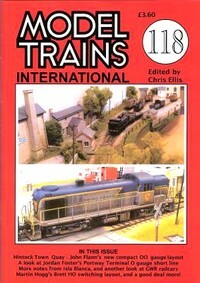 One or two truly small layouts are present in the publication, but they were labelled "portable layouts". And again, it ultimately all pointed to a much larger setting. Driven by an entirely different perspective and mindset, British railway modellers continued to develop the concept of the "terminus to fiddle yard" further, effectively shrinking it from running around two walls of a room to a short linear layout - and the resulting "shelf layout" formula gradually became an accepted mainstream practice for those who wanted a layout but lacked the space and/or the inclination to build a fully blown mainline setup. The prototype settings modelled continued to be mostly backwater branchline terminus stations, but the approaching line of track got shorter and shorter. A very compact (4'-6" x 13" / 135 x 32,5 cm) example of this type of British shelf layout is Dennis Beale's "Raikes Street" (an article on this layout appeared in the January 1995 issue of Railway Modeller), which differs from other shelf layout settings by featuring a moveable piece of track concealed within a factory building which drastically cuts down on the speace needed for its runaround track arrangement. In contrast to this, back in December 1992, Model Railroader featured a project layout built to the "classic US" 4'x8' oval continuous-run formula and labelled it as "a small layout anyone can build". This is not to say that short and narrow layouts were unheard of in US modelling - but they were the exception to the rule and generally few and far between. But things were slowly changing - the popularization of the internet since the mid-1990s gave new railway modelling ideas a massive boost as the world wide web profoundly changed the way the hobby communicates and conducts research. 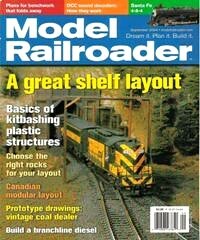 The popular hobby magazines on both sides of the Atlantic were still showcasing big and beautiful layouts, but the railway modellers who first took to the internet were less so inclined. Very often, the layouts they were building, operating and describing on the web were small shelf-layouts, some of them even in "minimum space". 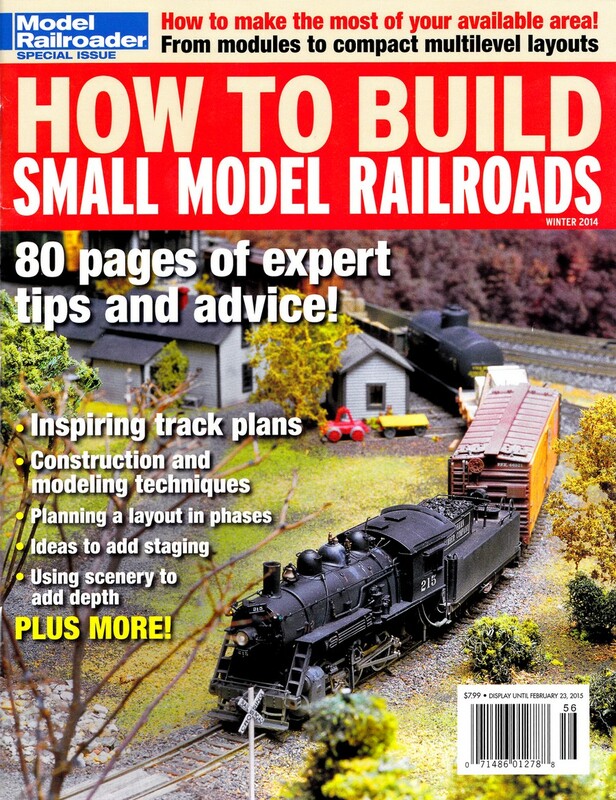 One important such example which became a source of inspiration for many was Scot Osterweil's NYC Highland Terminal switching layout, which made its online debut in 1994 (Scot presented an update in Kalmbach's 2015 How to Build Small Model Railroads). But it was not all virtual - in the UK, Chris Ellis, former editor of the Airfix Magazine, produced and published Model Trains International, highlighting a modelling approach which was the pure anti-thesis of the sprawling British "Railway of the Month" and the US "Basement Empire" and focused on shortlines pretty much around the globe (MTI, which had a small but loyal readership, ran for a total of 118 issues before being cancelled in 2015 as Ellis retired). Gradually, the concept of building and running a small layout in its own right and not as a stepping stone or a stop gap on the way to the XXL size "dream layout" had progressed into UK (and, to a lesser extent, European) mainstream modelling. 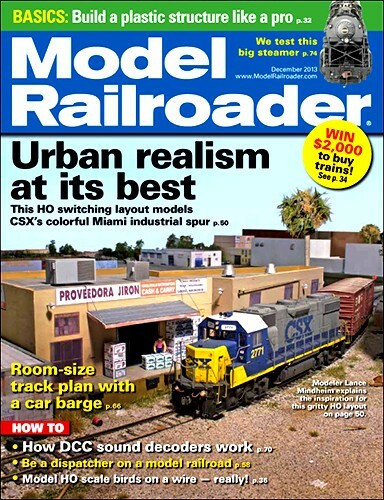 It also started to appear more and more in North American modelling, as the cover of the September 2004 issue of Model Railroader shows. Even smaller layouts started to appear in the UK, which were just one little step up from a static diorama - such as Tony Wood's Barber's Bridge (which was featured in the January 2000 issue of Rail Express Magazine). An absolute minimum-space layout, the scenic section of this diesel fuelling point measures only 22" x 8" (55 x 20 cm), with an additional 14" (35 cm) of hidden track allowing for movement of the locos onto the three short sidings. The layout was built within a few weeks and at a cost of just £20 at the time. Over the years, various concepts evolved around what came to be called "minimum space layouts" in British modelling terminology. Most of these center on how to run trains on a small layout in order to sustain interest in it, but some have taken up the question of how small a layout can get and still be workable, leading to a whole range of "micro layouts" which really are as small as you can probably get. This modelling concept found its master in the late Carl Arendt, whose excellent website on micro layouts is still being run and updated to this day. The micro and the minimal space layouts really form a special category of small layouts (which often also allow the use of larger modelling scales in spite of the small overall layout footprint, such as e.g. Jim Read's O Gauge 7mm micro layouts), but Carl Arendt's early internet presence (he launched his website in 2001) along with his books no doubt helped to make the concept more popular with North American modellers. Just to which extent can be seen from the fact that Model Railroader issued a special edition on how to build and run small layouts in January 2015. The layouts portrayed include a wide variety of structural concepts (including a modular approach) but they also illustrate that the understanding of what can rightfully be called small is still open to interpretation as room sized pikes find their place as well (where possibly the characterization narrow would be more appropriate as they tend to run along the walls of a room). Also included is a portrayal of John Allen, who way back in the 1950s already felt that modellers should "start small and build well. Plan your small railroad for operation rather than as a race track, and build it with care. You will be amazed at how much fun a small pike can be." How much the "small layout" has shrunk over time can be glanced from the fact that his original Gorre & Daphetid RR - to which Allen was refering in the quote above - had a footprint of 3'-7" x 6'-8". Newer layouts depicted in How to Build Small Model Railroads, however, show a clear tendency of leaning more and more to the (smaller) British / European shelf layout concept. On any layout - big or small - you can either be running trains or operating trains. "Running trains" obviously is a broad concept. All it really indicates is that model trains must be moving some way or another. At one end of the spectrum, they might just be orbiting on an oval of track at top speed, and the train might consist of an American diesel locomotive, a couple of Australian passenger coaches, one Swiss restaurant car (complete with pantograph for overhead electrification), and last but not least a British guard's van. However, in railway modelling lingo "running trains" usually indicates something at the other end of the concept, namely aiming at creating a coherent picture of both the trains and the environment they run through. This would mean that American locomotives of a certain period pull American rolling stock of (more or less) the same period while running through an American landscape of (more or less) the period in question. The amount of compromise allowed may vary, but in general "running trains" means that a layout will reflect some amount of coherence and accuracy. "Operating trains" goes one step further, although it doesn't necessarily imply a higher degree of prototypical accuracy in terms of rolling stock and all that goes with it. The word "operating" is used, above all, to indicate that models are run to reflect - but not necessarily faithfully replicate - one very important and central aspect of any real railway : there's a purpose to it. On the real railways, trains hardly ever move "just like that". Maybe it's to earn revenue by transporting passengers - such as the EMU shown here, speeding up to London and away from the camera - or maybe it's to maintain the infrastructure, which is the basis of being able to run such revenue earning trains - such as the ballast train double-headed by two class 33 diesels heading someplace south on the UK rail network. "Operating" trains on a layout is an attempt to mimick this by attributing a purpose to most or even all moves taking place. Some of the concepts applied in order to achieve this were formed in the context of basement empires, others were developed explicitly with small layouts in mind. Some attempt to be as close to actual prototype operation as possible, while others are loose interpretations. For small layouts, the equation is a simple one: the lack of space needs to be compensated by more interest generated by the moves which take place on the layout. Copying the real rail transportation system's way of functioning requires a concept. This doesn't mean that things have to be complex or complicated - in fact, a simple concept usually works best. A good basic way of starting is to establish where the model railway system is located, the era, and how it is connected to the rest of the world, because these few points determine the traffic patterns of a layout and thus provide a reason for its existence - because on the real thing, traffic pattern means customers and revenues, and without those, railways will grind to a halt and disappear very quickly. There are a number of operational concepts which can be applied to a small layout. You could have mainly passenger services, or passenger services with an equal share of freight, or freight only, or even a specialised setting with specialised traffic, such as a motive power depot or a civil engineer's yard. One possible example to illustrate this point comes from the preserved Kent & East Sussex Railway, where an English Electric Class 08 0-6-0 diesel shunter is ready in April 2001 to shunt stock at the railway's main station site at Tenterden. All of these options are feasible, but in practice layouts which have a strong emphasis on what can be seen as "localized operation" (i.e. so-called "shunting" or "switching" layouts) feature a predominance of freight operations or are even freight-only. This kind of operational concept is usually the best choice if the layout needs to be small - simply because it provides a "realistic feel" and even prototypical operation within baseboard measurements which are open to (almost) everybody. The reasons for this are quite simple: shunters are usually relatively short engines, and freight stock is usually a lot shorter than passenger coaches. 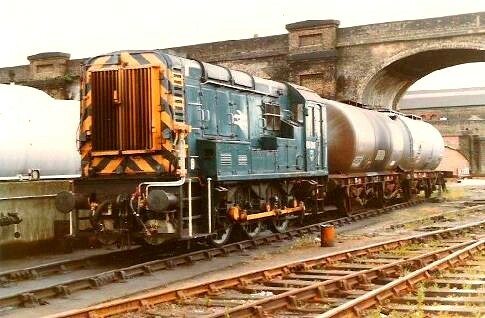 The example shown here is a Class 09 diesel locomotive at Stewarts Lane Depot, London, shunting two TTA tank wagons on a siding. Within the space of only a few yards details abound with loads of inspiration for a shunting layout. Both Tenterden and the side tracks at Stewarts Lane convey the constrained space often replicated by modellers, i.e. "cramped quarters" with a lot of track in a small space. Certain rail served industries however tend to have large footprints and a sprawling concourse in which shunting takes place - such as Conrad Yelvington Distributer's aggregate terminal in Wildwood Florida, where the local Alco S2m presents an image of a "switcher in a landscape" in May 2014. Every country has its own approach and philosophy regarding railway modelling, which often reflects the basic characteristics of its own prototype railway system. 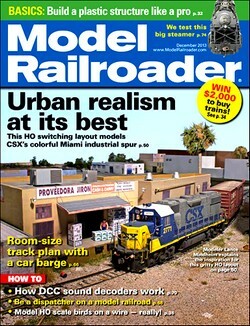 It is therefore hardly surprising that mainstream US railroad modelling focuses primarily on freight, and switching layouts have been a popular facet of North American prototype modelling for a long time and feature frequently in magazines - such as the Boston Union Freight Railroad, taking center stage on the cover of the September 2000 issue of Model Railroader. Contrary to this, a British outline model railway layout completely devoid of any form of facilities catering for passengers has for the longest time been unusual to say the least. 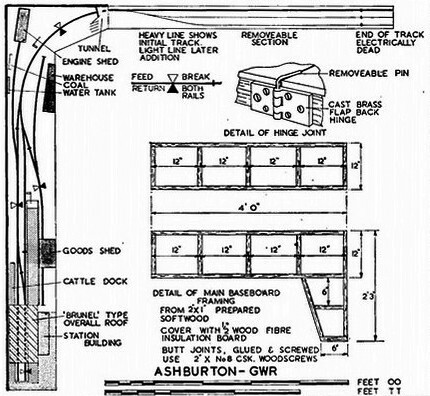 Nonetheless, the earliest published example of a freight-only concept for a layout seemingly comes from the UK: In the June 1926 issue of Model Railway News, A.R. Walkley, a member of the Wimbledon Model Railway Club (the second oldest in Britain), published an article on his "Railway in a suitcase", which was pioneering in terms of being H0 scale two-rail. The layout also featured a system of automatic coupling (really an essential feature for a shunting layout) which later on was marketed by Tri-ang, became known as the "tension lock coupler" and is still used as standard coupler on many UK ready to run models today (thanks to Morgan Lee, longtime librarian of Wimbledon MRC, for much of this information). In terms of British railway modelling history, Wakeley's layout can be regarded as the ancestor of all UK shunting layouts, as it concentrated entirely on freight . On a historical note, Walkley - together with two fellow modellers from the then newly-formed Wimbledon MRC (A. Stewart-Reidpath and Michael Longridge) - began experimenting with models roughly half the size of the established 0 gauge sometime in 1923. 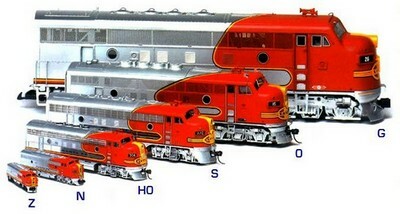 In the end, the three modellers found 3.5mm scale to be the ideal modelling ratio - and H0 scale was born. Another typical example of the "1' x 4' shunting layout" type is Dave Howell's "63rd Street Yard" - an urban yard with a couple of freight facilities and a low-relief backscene for added atmosphere. An American layout as the name implies, switching moves are taken care of by a GE 44 tonner and an S2, with 40' boxcars the staple freight stock. The 3-way point is both a space saver and an added bonus in creating the feel of a small and tight but sprawling urban yard. However, shunting layouts need not necessarily be small - they can be enormous too, if for example they incorporate large classificiation yards. The CSX yard in Wildwood, Florida, would not be described as overly big by prototype standards, yet it has a spacious and sweeping layout and overall atmosphere which would be impossible to model in a small space without losing much (if not all) of its characteristics. But even when you go for a small, shelf-type shunting layout, it's not necessarily the lack of space which provides the motivation for this. A number of people opt for this kind of layout because it provides interesting operational possibilities. "It is not obligatory to incorporate passenger facilities into a layout, and indeed there can be very real benefits when a small layout is designed around a specialised service." However, only 3 or 4 of the 60 layout plans in the booklet reflect this statement, and to this day, the vast majority of British modellers seem to suffer from horror vacui in the absence of passenger facilities on a model railway layout, although the internet - having gone from a niche interest in the mid-1990s to now being the single most important source of information and communication platform for all hobbies - helped changed this heavily lopsided approach to British railway modelling. Searching in Google for "switching layout" yields approximately 48,800 hits (January 2017). The string "shunting layout" is less frequent, but around 8,160 webpages will still keep you busy perusing their content. Plus, layouts depicting shunting yards or switching areas are popular topics in many online discussion groups and fora. As their name clearly implies, small shunting layouts already have an operational concept and a purpose to sustain interest in running locomotives and stock on it: shunting - which is defined by the Oxford English Dictionary as "pushing or pulling a train or part of a train from the main line to a siding or from one line of rails to another" (its equivalent in North American railway terminology according to the US Department of Transportation being switching). As with any layout regardless of its size, a good basic way to start building up a concept is to establish the geographical setting and the era of the shunting layout as well as how it is connected to the rest of the world. These few points determine the reason for its existence - in the form of its traffic patterns, customers and revenues. On a small shunting layout, there's usually only a handful of customers receiving and generating freight. If you take the following trackplan as an example, things might look something like this. The four customers here are represented by the first four letters of the alphabet, but you could just as easily use the four suits of a deck of cards, so that A = Hearts, B = Spades, C = Diamonds, D = Clubs. A deck of cards is shuffled and a card drawn for each freight car on the incoming track (e.g. the lower right hand track in the diagram above). Thus the first car in that row of incoming traffic may draw a card of spades and be required to be moved to industry B (= spades), car #2 hearts (industry A = hearts), etc. The problem with the traffic flow generated by this system is that it doesn't take into account the differences between customers A, B, C and D, because rolling stock is moved to locations regardless of its type and thus the goods it may transport. However, if customer A is a printer (who would above all want to receive paper and ship printed products), he will quickly turn his back on the railway if it keeps sending tank cars and coal hoppers to his loading dock. A sound concept therefore indicates the specific types of freight received and shipped by each industry on the layout so that only appropriate rolling stock may be delivered to any given industry. In fact, even one single customer may have different transportation requirements at different locations. In this following example, still based on the same trackplan, the entire layout serves just one customer, a paper manufacturing plant. Building "B" is the loading dock for the finished product, i.e. it ships paper. Building "D" along with the adjacent tanks is the storage area for both liquid and solid chemicals used, while "C" is the unloading dock for collected paper to be recycled and "A" the unloading dock for cellulose. 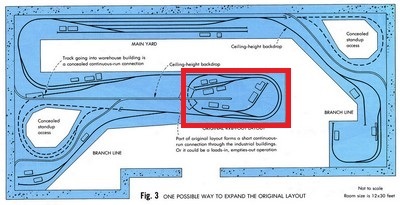 While this is obviously a simplified layman's idea of how a paper manufacturing plant might work, it provides the shunting layout with a clear concept of what is and what may be moved where and why. On the basis of this traffic flow concept, a detailed list can now be drawn up, indicating which type of rolling stock may be used where. For example, tank cars will only be dropped off at "D", whereas covered freight cars may go anywhere (possibly arriving full, dropped of at "C" first and then, once unloaded, moved to "B" for loading). Special consignments (delivery of heavy machinery or spares) may allow for special freight stock. Here are five views taken in April 2002 depicting the internal rail service at the cardboard factory in Deisswil (Switzerland), illustrating typical aspects of this type of traffic (since shut down along with the factory). 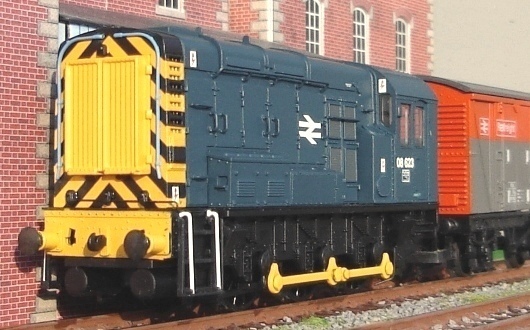 Motive power is provided by a small company-owned shunter (which was acquired new in this specific case, but which could well be a second-hand shunter bought from a larger private or state-owned rail company). The track is both covered (in places where road traffic needs to have access) and ballasted, with fencing present prominently - after all this is private property. The factory buildings represent a mix of older and more modern structures, and different types of freight rolling stock to meet the requirements of the rail customer - in this case tank cars (for liquid chemicals), covered freight cars (for solid material which needs some protection) and open freight cars, covered with tarpaulins in some cases, for material which will not suffer from exposure. The advantage of an operational concept governing traffic flow is added realism and an extra challenge when switching. The setback is just as evident: the example above is definitely not suited for a layout which boasts a collection of 20+ coal hoppers - unless the plant actually runs on coal. Once an operational concept for a switching layout is drawn up and established, the only thing needed to finally do some interesting and challenging switching is to generate the traffic flow. Over the years, a number of systems doing precisely this (generally referred to as "car forwarding systems") have originated with American prototype modellers. Although rarely used for other prototype modelling, all of these systems work equally well for any kind of standard railway system. The specified car switch list generates instructions for freight cars on a layout, taking into account their type and potential delivery locations. The basic concept of most car card systems goes back to Doug Smith's description in the December 1961 issue of Model Railroader. Obviously, these physical cards can be - and to an increasing extent are - substituted by virtual cards or screen output on a computer system or handheld device which will also take care of the chance car selection and load distribution. Whereas the card and waybill system centers on identifying individual freight stock and linking these with destination orders, the Scenario List System focusses on customers, i.e. locations and industries, where freight may be picked up and/or delivered. Each industry on a layout is analysed in terms of possible scenarios. The Consolidated Tooling Company, for example, is assumed to receive and ship products mainly in boxcars, but occasionally also to receive goods transported on a flat car. 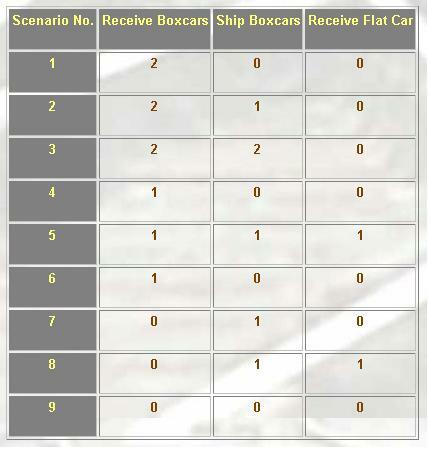 The possible scenarios here are: Customer receives 0-2 boxcars, ships 0-2 boxcars, receives 0-1 flat car. A selection is made from all possible combinations in order to produce the scenarios given as example below. For every operating session, one of these scenarios is selected for the "Consolidated Tooling Co". In order to acknowledge that according to the traffic flow concept worked out for this customer some of these scenarios are supposed to be more frequent than others, the scenario list is broken down to scenario cards (one card giving one scenario) in varying numbers. As a result, scenarios 2 and 3 would appear on 5 scenario cards each, whereas all scenarios involving the delivery of a flat car would only have one. Shuffling these cards, the chances of having a flat car delivered would thus be smaller. Once the "move" is made, the card goes to the back of the deck of scenario cards, making sure that flat cars won't appear too frequently at the "Consolidated Tooling Co."
This system works well for small layouts and is fairly realistic in its approach: rail customers usually don't care at all whether the boxcar used to ship their goods is brown, green, yellow or pink as long as they turn up on time and in sufficient numbers. Due to its flexibility regarding choice of rolling stock to be used, this system may not produce challenges in the sense of asking you, by chance, to switch the most awkwardly placed boxcar to the tightest spot on the layout - but there's always the possibility of creating additional rules if things seem to get too easy. The majority of shunting and switching layouts are rooted in what could loosely be called the steam/diesel transition era - for two reasons. First, as seen above, the concept began to be popularized in the 1950s and 1960s, and secondly both motive power and rolling stock from that era are considerably shorter than their more modern counterparts (e.g. 40' boxcars rather than 50' or even 60' boxcars) and therefore allow for smaller layouts. Combining this era (when even less-than-carload traffic by rail was still common) with the necessary compression of railway modelling very often results in single-car industries on shunting layouts. For modellers who want to replicate current railway operations, however, this conceptual formula simply doesn't match up with the real world. For several years now a number of modellers - who almost exclusively model North American railroads - have come up with ideas and answers on how to adapt the shunting layout formula in order to make it both workable and realistic for modelling the modern railway scene. Amongst these, Lance Mindheim is probably the best known, as he combines stunning modelling with a fully fledged concept of how to design, build and operate a realistic (modern) switching layout which he has highlighted in four books published between 2009 and 2011 (How to Design a Small Switching Layout, 8 Realistic Track Plans for Small Switching Layouts, How to Build a Switching Layout, and How to Operate a Modern Era Switching Layout). His various Florida industrial park and spur layouts have almost become a model railroading sub-genre, inspiring many subsequent Sunshine State switching layouts; Mindheim also runs a blog on model railroad design in conjunction with his commercial layout planning service. A switch is a costly device: it requires handling in the process of switching (costing the railroad time while it's doing its job) and needs maintenance (which actually costs the railroad money). Therefore, contemporary track layouts have done away with all unnecessary switches, resulting in some cases in single track industrial spurs of substantial length - which in model form could mean a switching layout with just one or two sidings. A runaround track requires at least two switches, and having the locomotive run around its train consumes time and fuel, so the trackage in a modern industrial park will most likely only have switches pointing in one direction so that the switcher can push and pull cars without the need to run around its train. Therefore, you should aim to not put a runaround where the prototype doesn't need or have one. The "one car customer" is, in all but a few exceptions, a thing of the past, and has been replaced either by large rail customer complexes or by switching destinations (such as a warehouse) which in effect serve multiple customers. Therefore, you should have structures on your layout with at least two designated places where freight cars can be set out, most probably serving more than one customer. Putting these two principles to work on a modern switching layout does take it very close to being prototypically correct. The result from a "traditional perspective", however, is a very simple track layout which looks rather bare and most probably also lacks one of the railroad modeller's favourite devices, the runaround track, as well as other "complications" such as switchback sidings (which is why I refer to it as the "modern minimalist" approach). However, unlike the traditional steam/diesel transition era layout, the operational "spice" on such a modern switching layout is not generated by the trackplan, but by the way the spurs and industries situated along them are switched - by using so-called car spots. As railroads merged and lost their local foothold, names or random numbers given to tracks serving customers became incomprehensible to a centralized dispatch structure. Parallel to the introduction of computer systems in the late 1960s, US railroads drew up industry schematic maps for their road crews. They list industry information such as where to spot loaded or empty cars for unloading/loading for a specific customer, the track capacities, and other pertinent information, all in a consistent format. Different US railroads use(d) differing terminology for this car spot designation system; the acronym SPINS is an abbreviation for Southern Pacific Industry Numbering System - it originated on the SP but was also used by e.g. BN. CLIC (Car Location Identity Codes) was a Santa Fe term for the same thing, as was ZTS (Zone, Track, Spot) on Conrail. The example shown here comes from the 1987 Conrail ZTS for its New England Division - and really explains it all. If a freight car is to be set out at 04-829-07, then the ZTS map will tell any crew that its destination is car spot 07 on track 829 in Zone 04, and that the customer in question is the Generic Inc. It is also easy to see how requiring freight cars to be placed in specific spots can add not only additional realism to a modern era switching layout but also beef up the challenge of operating it considerably. All of a sudden, that single industrial spur doesn't seem that bleak anymore. The United Warehouse in Wichita illustrates what this looks like in real life, but even a drastically shortened building can provide operating interest on a switching layout using car spots if it either serves several customers or a single customer requires specific goods to be delivered to specific locations on his spur. Switching on a "minimalist modern" layout will mostly consist of pushing and pulling cars in and out of sidings until the required order is arrived at - and as such is in fact very similar to switching an Inglenook Sidings puzzle. Just like the latter, cars could be assigned spots by e.g. the random throw of a dice; in his books, Lance Mindheim suggests setting up the switching order yourself but making the most of the switcher's moves by imitating certain prototype procedures and remembering to take it slow as switching in 1:1 scale is a time consuming job. The conductor is throwing a switch in Wildwood FL yard in May 2014 as CSX "road slug" GP39-2 #2383 and GP40-2 #6983 are busy pushing and pulling cars as described above - although in this case they are not serving car spots but rather "blocking" a consist, i.e. making up a northbound train. Again not necessarily small in size, a modern era switching layout can offer a lot more operating potential than its simple trackplan might suggest if a car spotting system is used. Naturally, many prototype locations still have more complex trackwork in evidence today (a fact Mindheim and others are more than willing to admit), but it is becoming the exception. And ultimately the simple track layout has the same advantage for the modeller that it has for the real railroad company: fewer switches and less track means spending less money on infrastructure and less time on maintenance. Probably the main attraction of a "modern minimalist" switching layout is that it allows the use of contemporary rolling stock with single car payloads - which has become a rarity in the age of the "block train" (carrying a long string of freight cars loaded with the same cargo, e.g. containers or coal) but which used to be the railway's daily bread. Using "car spotting" thus works just as well for a 1950's or 1960's layout and is not restricted to any geographical area at all. The new goods shed in Peterborough embodied British Railway's perception of modernised freight working by rail; goods vans could be unloaded either into the goods shed (where a conveyor belt helped in moving the goods to their correct storage space) or outwards onto road vehicules which distributed the goods elsewhere. 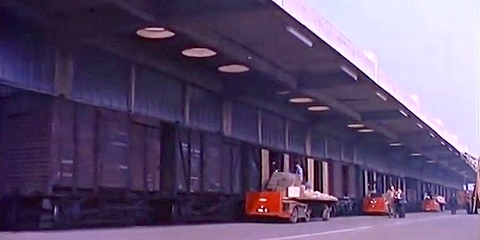 It was a 1960's version of a transload facility, which certainly required the goods vans to be set out in the correct order so that they ended up being "spotted" where they were needed. All of the systems of operating a shunting layout discussed above have one purpose: to generate interest by means of a consistent traffic flow. Although they may come up with some awkward shunting moves, they are not designed to introduce such complications deliberately. Most of the time, things will flow easily. A shunting puzzle, however, is a shunting layout which deliberately introduces complications which need to be solved in order to get the shunting done. Usually, these complications are generated by a set of restrictions or rules. For example, sidings can be short and thus require the operator to think ahead of his moves unless he wants everything clogged up, or rules may require a certain specific order into which freight stock must be shunted. The example layout used above to illustrate a possible operational concept based on a paper factory, by the way, uses the "Timesaver" trackplan - the classic US switching puzzle.